This text provides an introduction to the science that governs the interaction of light and matter (in the gas phase). 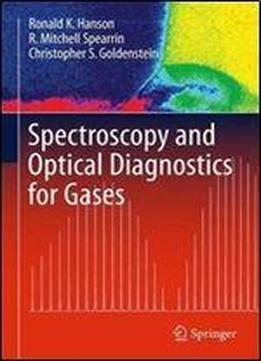 It provides readers with the basic knowledge to exploit the light-matter interaction to develop quantitative tools for gas analysis (i.e. optical diagnostics) and understand and interpret the results of spectroscopic measurements. The authors pair the basics of gasphase spectroscopy with coverage of key optical diagnostic techniques utilized by practicing engineers and scientists to measure fundamental flowfield properties. The text is organized to cover three subtopics of gasphase spectroscopy: (1) spectral line positions, (2) spectral line strengths, and (3) spectral lineshapes by way of absorption, emission, and scattering interactions. The latter part of the book describes optical measurement techniques and equipment. Key subspecialties include laser induced fluorescence, tunable laser absorption spectroscopy, and wavelength modulation spectroscopy. It is ideal for students and practitioners across a range of applied sciences including mechanical, aerospace, chemical, and materials engineering.